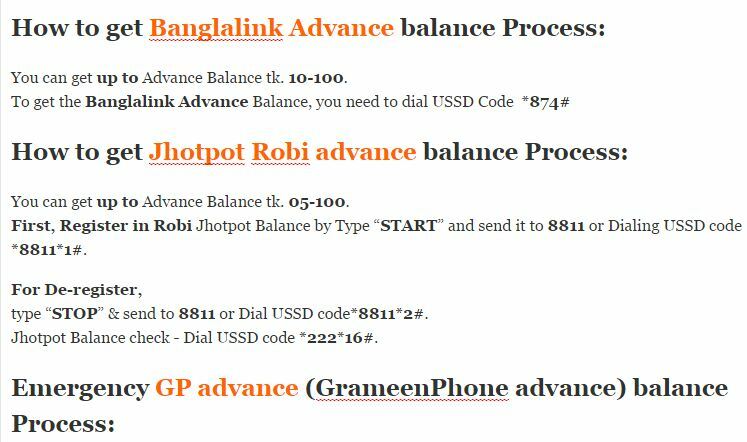 How to get advance balance in Robi, GP, Airtel, Banglalink & Teletalk Number? You can Easy to get emergency Balance for Bangladeshi mobile operator in this post. we are explain easy for you. You can get up to Advance Balance tk. 10-100. You can get up to Advance Balance tk. 05-100. First, Register in Robi Jhotpot Balance by Type “START” and send it to 8811 or Dialing USSD code *8811*1#. For De-register, type “STOP” & send to 8811 or Dial USSD code*8811*2#. Jhotpot Balance check – Dial USSD code *222*16#. To get the Emergency GP advance, you need to Dial USSD code *1010*1#. Now you can get talktime Loan and internet and sms emergency balance anytime, anywhere! Not: You have to pay Interest 1tk for 05 tk loan & 2tk for 10tk loan. You can get up to Emergency Balance tk. 10-50. You can also send YES to 1122 to get your maximum eligible emergency balance . Send SMS 50 to get 50 Taka, 30 to get 30 Taka, 20 to get 20 Taka or 10 to get 10 Taka to 1122. Customers will be able to check the Emergency Balance status by dialing *1122# or SMS STATUS to 1122.